Ka-ching! Garfield goes coin-crazy in this unique take on the classic arcade favorite. 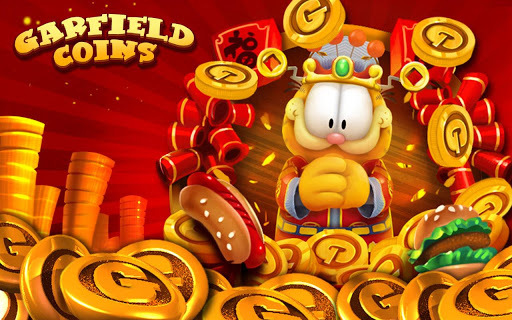 Help Garfield use an automatic pushing arm to win coins, costumes, toys and several collectibles in Garfield Coins! Help Garfield push coins, tokens and various prizes into the collection area by strategically dropping coins into the mechanism. You only have a limited amount of coins to spend per day, and objects that fall off the sides of the tray are lost forever, so play smart using plenty of strategy and various special abilities! Check this video to learn more about the game or visit its page on Google Play!